“After the Frack” was produced by QUEST Ohio’s Mary Fecteau. Hydraulic fracturing — better known as fracking — is a process of extracting natural gas that creates large amounts of contaminated wastewater. In this television segment, QUEST explores the science behind the disposal of this waste, and the issues that surround it. We caught up with QUEST Ohio producer Mary Fecteau to find out more about some of the issues surrounding fracking and her experience creating this video. Fracking is all over the news, and it is controversial. What made you want to take this topic on? Fecteau: I wanted to take it on because it’s all over the news and really controversial. I think there’s a lot of twisting of facts in this topic to serve a specific agenda, and I think the story needed to be told objectively, or as objectively as possible. I definitely had that moment when I wondered, “Why did I do this to myself?” The story’s so complex. There’s a lot of rhetoric, and on top of that I was dealing with a lot of ugly footage — trucks, pipes, and storage tanks. So why focus on the waste created by this fracking process? 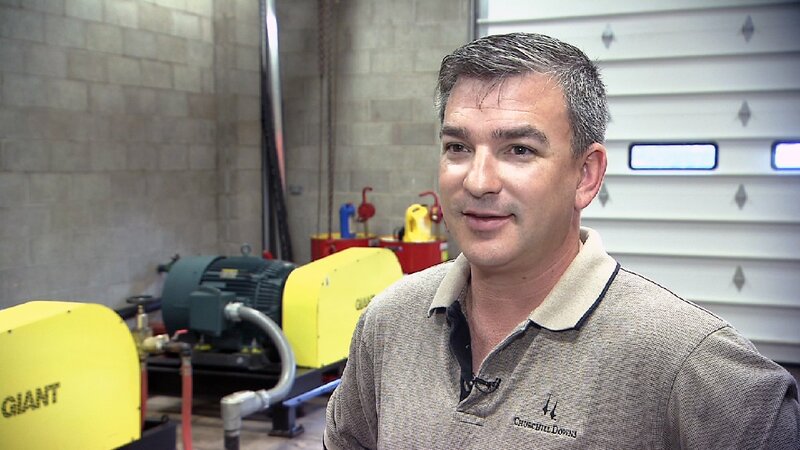 John Jack, Vice President of Business Development at GreenHunter Water, stands in front of large pumps, which pump wastewater from fracking into an underground disposal well. Fecteau: The fracking process uses massive amounts of highly pressurized fresh water to create cracks in the bedrock, which frees up the natural gas stored there. Much of this water then comes back up as contaminated wastewater. Ohio is, as some say, a “dumping ground” for this wastewater. Other states truck their wastewater in [to Ohio] to dispose of it here. This is because we have so many deep injection wells. Injection wells are the sites deep underground where this wastewater must be put. So we have about 200 injection wells in the state of Ohio, whereas neighboring states have far fewer. Pennsylvania has about 5 active wells and West Virginia about 60. You can see a lot of these wastewater trucks coming into the state, right? Fecteau: Oh yeah, they’re all over. Out toward the border of Pennsylvania you’ll see the trucks at rest stops and gas stations and coming in on I-80. What’s the main point of tension in your story? Fecteau: The tension centers on scientific disagreement about the potential for harm from the disposal of fracking wastewater. 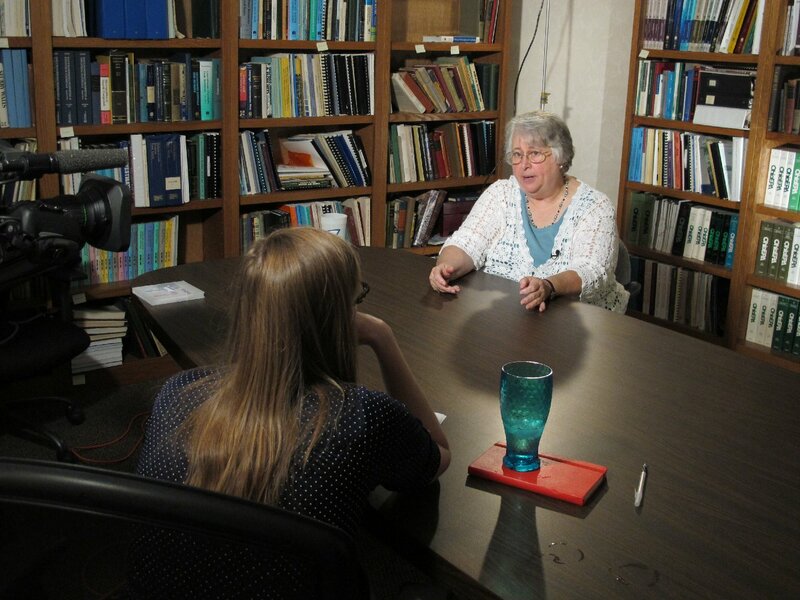 Our key interviewees were with Ohio Department of Natural Resources geologist Scott Kell and Dr. Julie Weatherington-Rice, who researches the fracking process. Fecteau: Oh, everything — everything from how long fracking has been practiced to what’s in the wastewater to how harmful is it. They don’t agree on whether injection wells are a safe way to contain the waste. 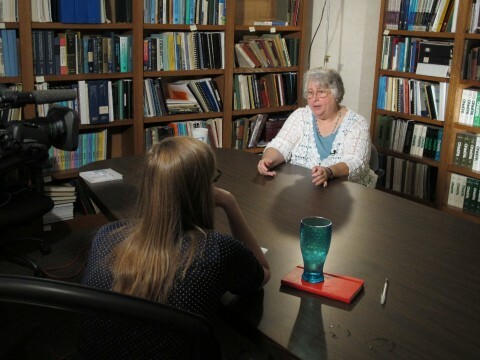 Producer Mary Fecteau interviews Dr. Julie Weatherington-Rice. Weatherington-Rice thinks that as the wells age, there’s great potential for them to leak, and that there have been documented surface-level leaks before. Kell says the injection well track record is solid, and there have been no instances of groundwater contamination since the process started in the early ’80s. There are also questions and disagreements around the radiation levels in the waste. What was the main challenge you faced in producing this piece? Fecteau: The main challenge was time, the time limitation [eight minutes] in which to tell the story. What did you have to leave on the cutting-room floor? Fecteau: So much! One thing I wish I could have gotten into more was the issue of earthquakes. I mentioned them but didn’t go into specifics about how injection wells cause earthquakes, and what safeguards the Ohio Department of Natural Resources is doing to prevent earthquakes in the future. The underlying science here is basically this: if you pump water deep underground near a fault, it could trigger the fault to slip, causing an earthquake. I also wish I could have gone more in depth about the chemicals used to frack. So, before the water gets injected into the ground to fracture a well, energy companies lace it with chemicals, which include benzene and other potentially hazardous chemicals. These chemicals help lubricate the process, prevent corrosion of the pipe, etc. They represent just a small portion of the total frack fluid, but their presence raises concerns for many people. What was your goal in producing this piece? Fecteau: I wanted to explore the science behind the disposal of fracking wastewater, and give people tools to form — and inform — their own views on it. Anne Glausser is the Coordinating Producer for QUEST Ohio. Before taking on this role, she was WCPN 90.3 FM & WVIZ/PBS ideastream’s health reporter and produced award-winning radio pieces. She’s spent time on both coasts (her college mascot was the banana slug! ), but grew up in the Midwest and is happy to be back home. She got started in radio at PRI’s Living on Earth, and has also spent time as a researcher at the Harvard School of Public Health. Anne got her SM from MIT’s Graduate Program in Science Writing.